Over the summer the dramatic rise in Iraq of the group calling itself the Islamic State took many, including U.S. policymakers, by surprise. In August the U.S. began conducting airstrikes against the Islamic State in Iraq at the request of the Iraqi and Kurdish authorities. In September the U.S. expanded these airstrikes to Syria as well, primarily against the Islamic State, as well as against some other militant groups. While MCC’s partner organizations in the region are deeply concerned by the rise of the Islamic State, they oppose the continuing U.S. airstrikes and the ever-widening U.S. military campaign. In December Congress approved $5 billion to fight the Islamic State, including a significant expansion of the program to train and equip Syrian opposition forces, at a cost of $720 million and another $1.6 billion to arm and equip forces in Iraq. The creation of these “proxy armies” for the U.S. is quite concerning, given the history of U.S. military involvement in the region. Also troubling is congressional approval of the Obama administration’s request to weaken human rights restrictions for Iraqi and Syrian groups. This means that U.S. funds can go to groups that may be committing human rights violations so that they can fight the Islamic State and its human rights violations. The Obama administration has said that its military actions are justified legally by the two “Authorizations for the Use of Military Force” that were approved in 2001 after the September 11 attacks and in 2002 to authorize the invasion of Iraq. Despite this claim, in November President Obama shifted his stance and announced he will seek a new authorization that is focused on fighting the Islamic State. 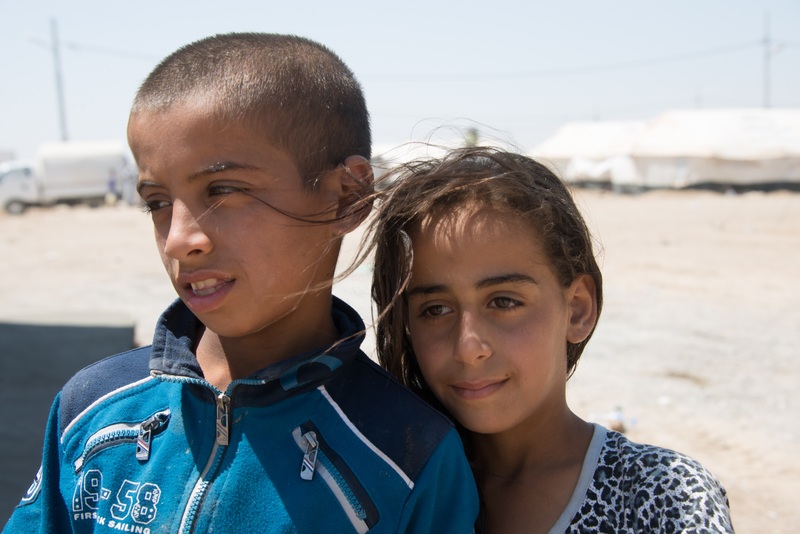 Children, whose names are withheld for security reasons, stand among tents at the U.N.-run Garmawa displaced persons camp in Nineveh Province, Iraqi Kurdistan. A truckload of food packages was distributed by an MCC partner organization to families in the camp. The Senate Foreign Relations Committee narrowly approved legislation providing authorization to use military force against the Islamic State just before the Senate adjourned in December, but it was not considered in the full Senate or House. Similar legislation will likely be debated and come up for a vote in the new Congress. In October MCC U.S. sent a letter to President Obama urging the U.S. to refrain from further airstrikes, to seek political solutions to the crises in Iraq and Syria, to increase humanitarian contributions and to support local Iraqis working for peace. For any long-term political solution to be reached in Iraq or Syria, Iran and other regional actors will need to be fully engaged. Thus, the extension of talks between the U.S., Britain, France, Germany, China and Russia with Iran over its nuclear program is an encouraging sign, as it could signal willingness to find common ground. In the fall our office hosted Deborah and James Fine, who had recently returned from four years of work with MCC in northern Iraq. They met with congressional offices and administration agencies to share their experiences. More than one congressional staffer commented on how unique it was to be able to hear from Americans with firsthand experience in the region.